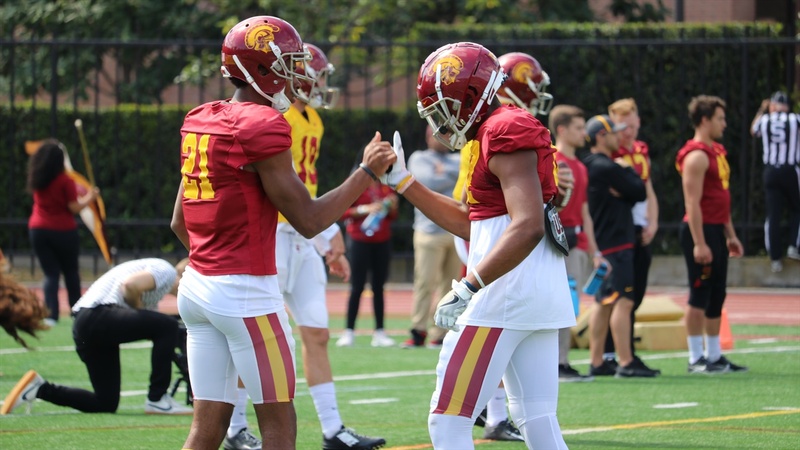 “There’s no confusion, there’s no hesitation and I think that’s my biggest takeaway from practice 1 to practice 12,” USC head coach Clay Helton said after Saturday’s spring football showcase. Speed and simplicity have been key as USC transitions into 2019. Throughout the spring, Helton has emphasized being fundamentally sound. Coordinators Clancy Pendergast and Graham Harrell have been tasked with handling the X’s and O’s. Harrell’s offense has increased USC’s speed, but is also simplistic. Multiple players are benefitting from this approach, including true freshman defensive lineman Drake Jackson. Jackson intercepted Jack Sears during the second portion of live 11-on-11 scrimmaging. The play was easily the highlight of Saturday’s practice, which was broadcasted live on the Pac-12 Network. “I tell you he reminds me a lot of Leonard [Williams],” said Helton. Williams, who starred at USC for three seasons, was selected with the sixth pick of the 2015 NFL Draft by the New York Jets. Practicing in front of a cable television audience, USC held back on showing the entirety of their schemes. But, Helton stressed that the Trojans’ offensive system is going to stay the same. The Trojans aren’t as focused on worrying about what their opponents think. Instead, the coaching staff has instituted the idea of setting a high standard. If USC can internally meet that standard, Helton believes they can compete with anyone in the country. During the first of two portions of 11-on-11s, redshirt freshman tailback Markese Stepp exploded down the right sideline for a 60-yard touchdown. The run took place on Kedon Slovis’ first snap. Both Slovis and JT Daniels completed all three of their passing attempts in the first live scrimmage. Saturday’s only 7-on-7 period was highlighted by a Matt Fink shuffle pass to redshirt junior tailback Quincy Jountti, who broke down the right sideline for a large gain. In total, the USC defense forced two turnovers. Redshirt senior cornerback Dominic Davis forced a fumble. Sophomore safety Talanoa Hufanga underwent successful surgery on a broken collarbone and Helton expects him to be back by the summertime. Redshirt sophomore offensive tackle Jalen McKenzie, who sat out Saturday, hyperextended his elbow in Thursday’s full pad practice but is projected to be back for next week. Junior offensive tackle Austin Jackson missed the showcase because of a family engagement. Redshirt junior tackle Bernard Schirmer was also missing for personal reasons. Junior tight end Josh Falo (AC sprain), freshman tight end Jude Wolfe (back), redshirt freshman linebacker Solomon Tuliaupupu (foot surgery) and redshirt senior tackle Clayton Bradley also missed Saturday’s action. The Trojans have one more full pad practice left before they meet the NCAA’s rule for tackle practices, which Helton will utilize next week. USC’s last action of spring will also feature a helmet and a shells practice.